HomeLifestyleAre Cosmetic Fillers a dangerous fantasy? Are Cosmetic Fillers a dangerous fantasy? Instagram is a fantasy, and for many people, it is a dangerous tool used for self-deprecating. The site shows image after image of beautiful people with seemingly perfect lives. Girls with flawless hair hold Gucci bags while men show off their six packs and white smiles. Instagram is where trends are born and die. However, a ‘trend’ that seems to be sticking around for the long run is cosmetic fillers. Cosmetic fillers, also known as dermal fillers are a non-surgical procedure that uses hyaluronic acid, a substance that is found naturally in the body, to plump lips and cheeks, fill creases and lines and enhance facial contours. Fillers can completely alter the shape of a face without going under the knife. In May 2015, 17-year-old Kylie Jenner finally opened up about her lip augmentation. After continually lying to the public that her ‘plump’ lips were due to good makeup hacks she admitted to having cosmetic lip fillers. Surprisingly, the majority of the public didn’t slam the makeup mogul for altering her face at such a young age and for lying about it. In fact, it appears to be the complete opposite. In August of the same year, she launched a line of lip kits. Although, customers knew her lips were augmented they still wanted to buy her products and emulate her look. Today ‘Kylie Cosmetics’ is worth an estimated $900 million. Kylie has somewhat ‘normalised’ lip fillers and has undoubtedly had a huge contribution to their growth in popularity. Leading cosmetic Doctor, Dr Frances Prenna Jones, said she noticed a surge in demand for lip filler in her clinic around the time Kylie admitted to getting them. She also said that they have been on a steady rise ever since. “Women of all ages enter my clinic for cosmetic lip treatments; half want a “natural” aesthetic, while the other half still ask for a “Kylie Jenner” look” she explained. Ireland is the number one country globally for carrying out the most online searches for lip fillers, according to research carried out by Cork University Hospital. WhatClinic.com revealed that there was a 101 per cent increase in enquiries about lip injections across Ireland in 2016, compared to the year before. It also added that lip fillers were the most popular non-surgical treatment in Ireland. Mark Doyle, a 21-year-old student from Dublin admits that he got lip fillers because they were a trend, however, he says that they have boosted his confidence. “I got lip fillers because it was a trend going around. I did always want to get them done growing up, though. My sister is a theatre nurse and did a course to certify herself in aesthetics so it was perfect being able to get them done at home” he explained to The College View. Currently, in Ireland there are no strict regulations on who can administer cosmetic fillers. Only Doctors and Dentists can administer Botox, however, cosmetic fillers can be administered by Beauty Therapists who complete an unregulated short course. After two to three days they are let loose in the public by training establishments who have nothing but money in their eyes and zero guilt. The Aesthetic training academy Ireland (ATAI) say that the biggest problem with these Beauticians administering cosmetic fillers unregulated is that they have no accountability. Technically, they are not breaking the law and if something goes wrong they will not be held accountable. This is incredibly dangerous for the public as they may have no come-back. When a Doctor, Dentist, Nurse or regulated practitioner does wrong, they can be struck off from practising. On the ATAI website they have suggestions on how the sector can be much better regulated. They explain that they believe that beauty therapists can learn how to administer cosmetic fillers, however, it must be safely and ethically done by completing a Level 7 qualification. Currently, there are only two pathways to a level 7, according to the ATAI. One is a three-year postgraduate degree in aesthetic medicine and the other is an accredited, regulated, Level 7 qualification awarded by IQ in the UK. 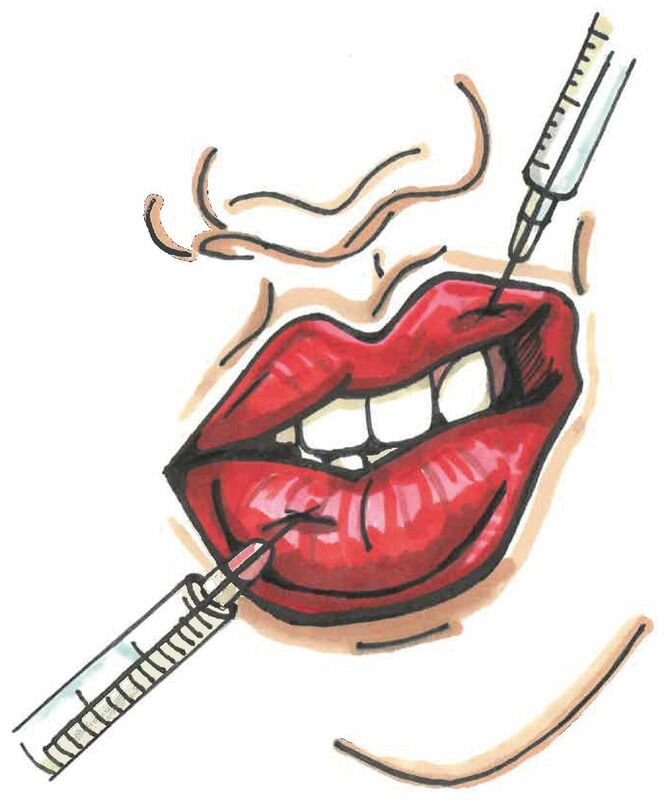 Last year, Vice journalist Jennyfer J. Walker, spoke out about her lip filler experience. She went to a beautician who was recommended to her on Instagram through celebs Katie Price and Megan McKenna. She scrolled through the company’s impressive Instagram pictures and presumed if it was good enough for these celebs it was good enough for her. Unfortunately for Jennyfer, her lips were lumpy and botched and nothing like she had desired. She explained that there was zero aftercare offered to her and that she could pay to have them dissolved if she wasn’t happy. She pleaded that better regulations must be put in place in the UK to stop what happened to her happening to others. Fillers are temporary and usually dissolve anywhere between four to six months. Thus, they need to be topped up two or three times a year. For an example of price, Therapie Clinic charge €195 for 0.5ml of cosmetic lip fillers and €295 for 1ml. Léa Flanagan is a 22-year-old makeup artist from Dublin who flew to Newcastle last month to get cheek, chin, jaw and lip fillers done. When asked what advice she would give to people considering getting cosmetic fillers she said “Think about it hard before getting them done and do your research on where to get them done, if it’s a cheap place then the product will most likely be cheap. If you do get them done remember that it isn’t permanent, if you don’t like it you can get it dissolved and it does break down”. Both Mark and Léa said that their new look has boosted their confidence, however, it is undeniable that social media has had a part to play on their decision to get fillers. “Yes 100% [social media has made getting fillers more popular] because you do find yourself comparing yourself to other people, especially being in the beauty industry. Image plays a huge part” said Léa. “Absolutely, social media has a part to play. Every blogger and influencer has them done. Kylie Jenner had a huge influence as well. It’s quite sad really when you think about it. I’m a boy, but some girls are starting to all look the same” Marc added. Cosmetic fillers are an incredible advancement in medicine and are a good alternative to going under the knife. However, it is important to note how unregulated they are in Ireland and what can go wrong. Instagram is a fantasy and even the most beautiful people on the site don’t look like what they portray on their feed.